The San Jose Blog: EPIC NEWS: KT Properties Planning Two New Towers in San Pedro Area!!! EPIC NEWS: KT Properties Planning Two New Towers in San Pedro Area!!! Downtown fans are about to have even more to look forward to! Nathan Donato-Weinstein from the Silicon Valley Business Journal broke a story last week that made my month. 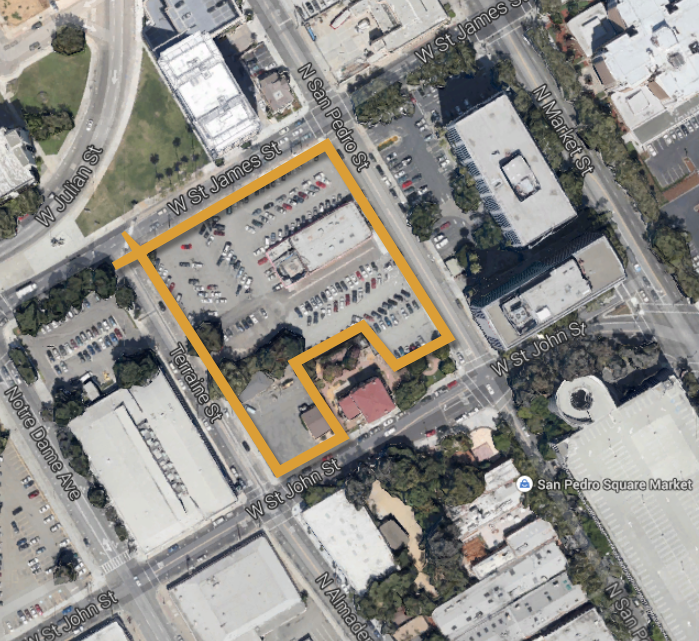 KT Properties--the developer behind Axis and One South Market--has acquired a huge 1.7-acre block of land between The San Pedro Square Market and City Heights. They are planning to build two high-rise residential towers with more than 600 units! KT properties has not released any sort of architectural drawing yet, but based on how Axis and the final design of One South turned out... I have high hopes that the buildings will look impressive. They did mention that they could have done one giant building but opted to go with two to add more texture to the skyline. Thankfully the buildings will not be identical like many towers Downtown, but they will have similarities. Also both towers will be towards the north of the lot to minimize visual impact around the historic Fallon House. There will also be a "significant" retail component extending along San Pedro Street! This is yet another organic expansion (in addition to Centerra) of the Downtown retail and entertainment epicenter started by the San Pedro Square Market. The plans should be submitted to City Hall in the next few weeks and they are hoping to get all approvals by the first quarter of 2014. That will mean a groundbreaking could happen as soon as mid-2014, but we'll have to wait and see. Great way to start the week! Now this is definitely worthy of being called 'epic'! Centerra just broke ground today with official ceremony sometime September as soon they can get all the parties(mayor,city council and others) together from Summer break. Call 408 287-0246 at the end of Aug. for ground breaking ceremony date. The crew are out in force today with construction/demo on the site beginning in earnest this week. This is like money in the bank, along with other 2 highrises(One S. Market and Family Justice Center) underway downtown. I haven't seen any real activity at the Family Justice Center site, other than the groundbreaking ceremony. It looks like it's reverted to a parking lot. Any details? I'm pretty sure that's one of the courts that will be replaced by the new Justice Center...so that parcel should be free for development in two/three years. The justice center site is still being used as a parking lot. There are no signs of construction activity at all. Anyone have any info on this?